I just learned about a new website from Bruce Mercer, called SumoPaint. It is free, online photoshop style website. I love combining tools to create new unique learning experiences and when I saw what SumoPaint could do, I instantly knew this would be great combined with GIFs. 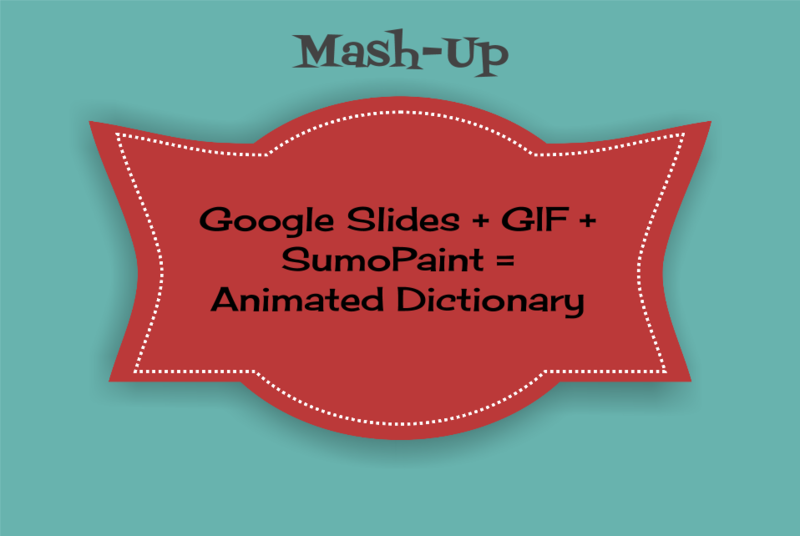 SumoPaint, combined with Google Slides and the MakeGif Video Capture Chrome Extension (UPDATE: MakeGif doesn't seem to be saving the GIFs at the moment. See below for an alternative if this is happening to you), will allow students to create animated dictionaries. What a great way for students to take ownership of their learning by creating individually animated dictionaries. You could also turn it into a group or whole class collaborative unit dictionary if limited on devices. SumoPaint Alternative: If you find SumoPaint to be too challenging, you can have the students create word art on the Google slide, fill with transparent, and make the line weight a high pixel. It won't have the same look, but you would remove the Sumo Paint step. MakeGIF Alternative: Use YouTube to GIF website (tutorial) to turn the video into a GIF. The quality of the GIF is not as good as MakeGIF, but it works. Here is a quick video showing you some examples and the steps I took to create the slides. Create a dictionary for each unit, assign in Classroom, and collaboratively as a class have students built based on unit vocabulary. Group students and assign various roles (example: GIF Maker, Word Maker, Definer). Have students collaboratively create a whole class animated dictionary. Have students create individual dictionaries and share with one another. This is so cool! Is there any way to save it from here as a GIF or something else that is animated? Looking through the Download As options from Slides it doesn't appear there is anything to save it as anything but still. Really, really love this idea for vocab! Unfortunately, as you can saw there is not a way to save a Google Slide as a GIF. I am glad that you love the idea. It is a fun way for students to interact with the words. This is Kathleen Forsell from Megan's computer! This is perfect for my plan for vocab in AP Psych! There are something like 50 words a unit and 14 units so I was thinking this would be a cool way to engage them and get rid of "vocab cards ugh" feelings!